Thank you for visiting our sump pump page. Foundation 1 has been creating happy customers in Kansas City since 2001. We are glad you visited today. CALL US TODAY TO SET UP A FREE APPOINTMENT: 816-682-8440. A great water pump is the heart of a functioning waterproofing and drainage system. Keep your basement dry with professional solutions. (Don’t trust your basement and belongings to a cheap sump pump from a big box store!) 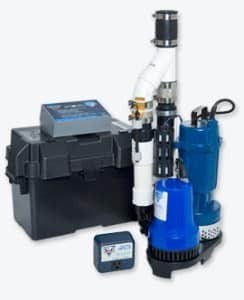 Remember, sump pumps have a limited lifespan; it is smart to periodically install a new, professional sump pump! Our full line of Pro Series™ primary sump pumps are built to run continuously 24 hours a day. These pumps are of a commercial grade and are only sold through and installed by qualified contractors. Visit our full website for more information or to set up an appointment. Ask us about our batter backup systems and new wifi modules for ongoing tracking and monitoring, and notifications to your smart phone! "Put it off too long, and too many sleepless nights squeegeeing water into my inadequate existing sump pump to keep it from ruining my finished living space and fearing the worst when the rains came. I'm very pleased with the results and the cost." "They exceeded the scope of work and were done on time. I was allowed to approve each stage of the process and felt like I was given excellent service." "Foundation 1 sent a great team out to my residence to replace a failed sump system and solve some drainage issues."